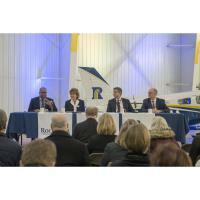 The College and its partners are hosting a public program open house on Thursday, February 7, from 3-6pm at the Signature Flight Services Events Hangar, 7300 Brataas Drive, SW, at the Rochester International Airport. Anyone interested in the program is encouraged to visit to see one of the planes, the simulator, speak with instructors, advisors, admissions specialists, and program administrators to see if Aviation is the right career path for them. Potential applicants are encouraged to attend one of two program information sessions coming up on March 1st and 7th. Established in 1915, RCTC is the largest higher education provider in the fastest-growing city in Minnesota, serving more than 7,500 students a year in credit courses and nearly 4,000 in non-credit continuing and workforce education programs. RCTC combines the best in liberal arts, technical, and life-long learning with more than 70 credit-based programs and over 100 credential options. RCTC’s expansive 518-acre campus includes university partnerships, a diverse student body, and a vibrant student life program. RCTC provides a unique learning environment that offers the feel of a four-year university campus with the commitment to access and opportunity of a two-year college. RCTC is a member of Minnesota State—a higher education system that includes 30 two-year community and technical colleges and seven state universities serving more than 430,000 students. It is the fifth-largest higher education system of its kind in the United States.